Grouper Caprese - Home. Made. Interest. Note: This post includes affiliate links. Please see our disclosure policy for details. Before we visited Aruba in October we emailed one of our favorite restaurants on the island, Que Pasa, and set up some time to come by and talk to their talented Chef, Miriam Vos. Que Pasa always has an eclectic mix of cuisines on their menu ranging from Dutch to Italian, Caribbean to Moroccan, but no matter what the dish is it is always presented beautifully and full of flavor. We have a few dishes that we always enjoy, like their seafood pil pil that we tried to recreate here, but I usually like to order at least one thing off the specials menu. 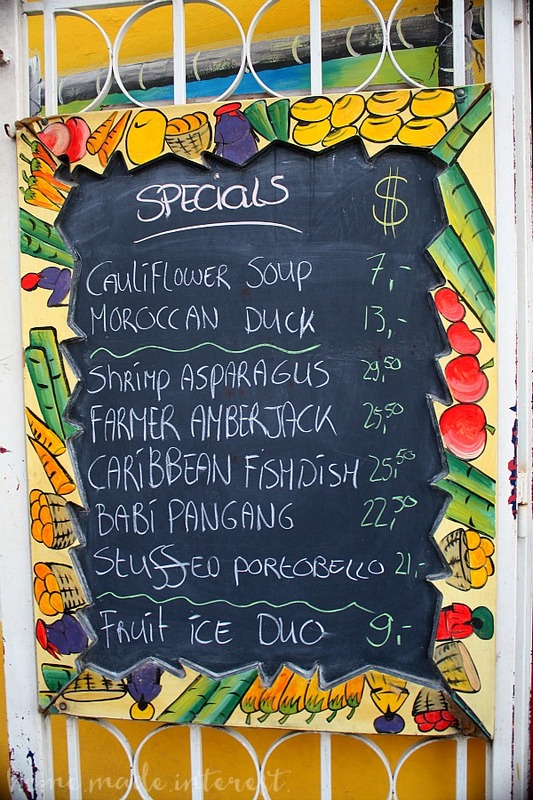 You never know what is going to be on the specials menu. Everything in Aruba is imported so Chef Miriam is at the mercy of the food shipments. Sometimes she orders something and it can take a few weeks to come in and while she wait she will have to change her menu plans to work with the ingredients she has. She does an amazing job! This Moroccan duck was one of my favorite dinners when we were there. 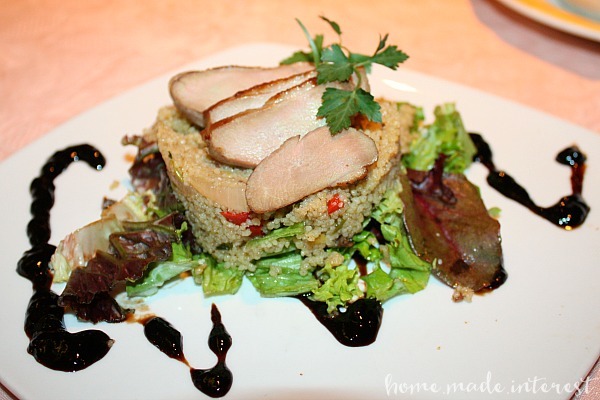 The duck was cooked perfectly and it was so nice and tender, and it was served on a bed of couscous that had the rich Moroccan flavors I love so much. I’m not going to pretend that dessert isn’t our favorite thing though. Chef Miriam had a chocolate ganache tart on the specials menu last time and Melinda and I snuck back a second night just for dessert so we could have it again! 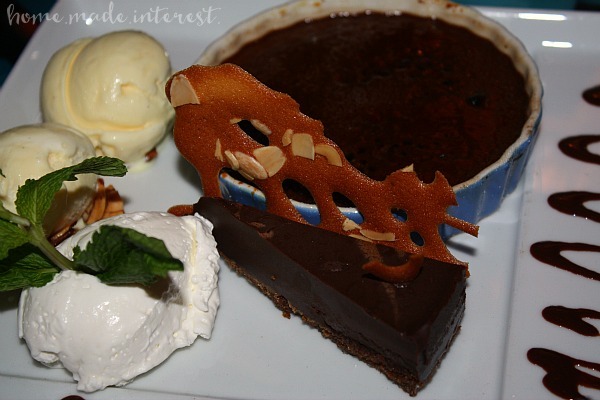 That’s also an amazing chocolate creme brulee on the plate…yum! When we met with Chef Miriam we asked if she had a recipe that we could share with you guys and she gave us this simple, but delicious recipe for Grouper Caprese. 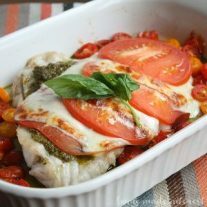 We baked ours as one large piece of grouper in a casserole dish but you can also make this recipe as individual fillets of grouper. Either way it is so good. 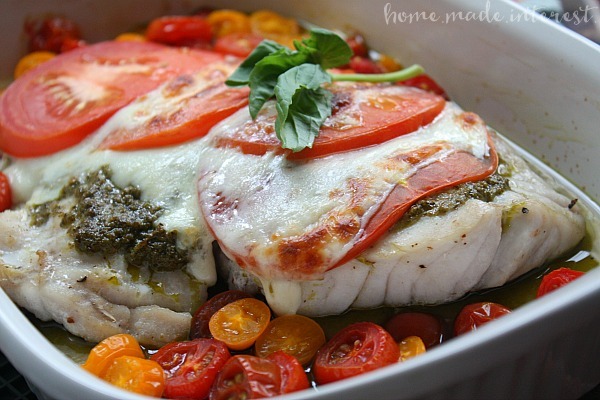 The pesto adds such a great flavor and I never would have thought to put it on fish. Alright now go read all about our Tips for Traveling to Aruba and book your next vacation. Tell the staff at Que Pasa we sent you!